RD 1.2.3: Water environment resilience and adaptation to change considers components of natural and managed water systems (and their interactions), their responses to multiple stressors, aspects of risk vs resilience and control measures. 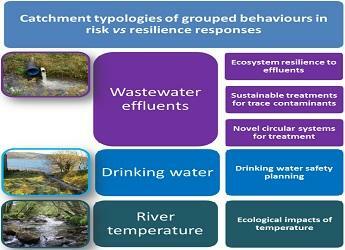 Catchment Typologies (objective 1) Seeks to enable better understanding of grouped behaviours in waterbody sensitivities and responses to multiple stressors and how we may combine catchment spatial data in meaningful ways related to functions. For more information please contact Marc Stutter. This work is a partnership between James Hutton Institute and the Centre for Ecology and Hydrology, Edinburgh. Ecosystem resilience to effluents seeks to understand how different properties of catchments and their waterbodies relate to the sensitivity of the water quality and aquatic ecological responses to pollution from effluents (wastewater point sources and septic tanks), relative to diffuse pollution sources from other land use activities. We are also developing tools such as tracer approaches for septic tank effluents. For more information please contact Marc Stutter. This work is a partnership between James Hutton Institute and the Centre for Ecology and Hydrology, Edinburgh. Sustainable treatments for trace contaminants looks for sorbent materials that have abilities to remove trace contaminants (pharmaceutical and personal care products, endocrine disruptor chemicals) and may be obtained from sustainable, or recycled sources to provide alternatives to conventional tertiary treatments for wastewaters. For more information contact Zulin Zhang. Novel circular systems for wastewater treatment uses experimental data with life cycle analysis modelling to examine systems for cleaning effluents and recycling of resources such as nutrients through coupling wastewater treatment with energy crop growth and anaerobic digestion technologies. For more information contact Lisa Avery. Drinking waters (objective 3) will develop drinking water safety planning as a strategy to better understand environmental risks (quantity, chemical and microbiological quality) to the raw source waters from which drinking waters are drawn. As part of this tools are being developed for tracing presence and sources of key pathogen risks to drinking waters by staff at the Moredun Research Institute. For general information across the project contact Marc Stutter. River temperature and impacts for aquatic ecology (objective 4) works with wider stakeholders to better understand the evidence and driving factors for temperature change in Scotland’s river waters, in terms of the occurrence of temperature extremes and any impacts for aquatic ecology, such as Salmon. For more information contact Rachel Helliwell. The package of work is underpinned by our long-term catchment and experimental datasets in RD1.2.1 and closely aligned to mechanistic, empirical and predictive modelling work in RD1.2.2. These data will be used across the rest of Work Package 1.2 looking at sustainable management of the water environment. Example outputs from the research to date include both technical studies describing science development and those putting the work in the context of our working with key stakeholders such as SEPA, Scottish Water, SNH, Forestry Commission Scotland, Fisheries Boards, Estates and others.